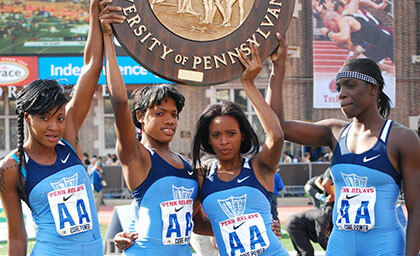 At the April 2014 Penn Relays in the US city Philadelphia, Edwin Allen High School from Clarendon, Jamaica demonstrated why they are one of history’s best. The blue-and-white-uniformed girls entered the Championship of America 4x800m relay as favorites after running an impressive 9mins, 09.23secs in their heat. With that time, they seem certain of a victory that would fit right into their plan to return to Jamaica with a perfect trifecta of gold medals. Columbia High School of New Jersey, running without ace and super athlete Olivia Baker, won their heat in 9:12.71, but the time was hardly seen as a threat. However, these times created a buzz as the finals approached, and Penn Relays fans braced themselves for another showdown between Jamaica and the USA. Bobbitt, Coleman, Baker, and Cowan. As the race got underway Edwin Allen fell behind by as much as 30 meters going into the final leg. However, they never seemed to panic, perhaps because they knew that they had the transcendent Marlena Eubanks running the anchor leg. On collecting the baton, Eubanks immediately went to work and erased the deficit in the first 400m, extending a lead of about 30 meters on the 2nd place runner in the last 400. Baker who was included in Columbia’s final quartet was in 5th position and about 40 meters behind Eubanks. As she began making her move, the mostly partisan Jamaican fans in attendance started to urge Eubanks. As if sensing what the crowd was trying to do, Eubanks attempted to make one last surge but found nothing in her legs as Baker past her with about 20 meters to go and stopped the clock in a sensational personal best 800m split of 2:02.55. As the chants of USA echoes all around the stadium by the small contingent of elated American supporters, the rest of the Columbia squad Alginer Bobbitt (2:17.21), Imani Coleman (2:11.82) and EmilIe Cowan (2:13.80) joined Baker in celebration as they got their first hold on a Championship of America gold medal and trophy. In a post-race interview, one Columbia team member said the victory was especially sweet because they denied Edwin Allen the opportunity of leaving America with all three Championship of America gold medals and titles. 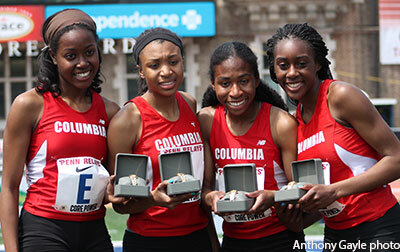 Columbia’s victory also landed them a place in US high school track and field history with the 2nd fastest time (8:45.37) by a US high school girls team. An hour and 15 minutes later was the second of the three big clashes involving Edwin Allen. At the announcement of the High School Girls 4x100m Championship of America, it was as if Edwin Allen were alone in the race, as all the fanfare centered on them, mainly to see if they could repeat the feat the accomplished a few weeks before when they set a High School Girls 4x100m world record (43.95). Spencer, Eubanks, Cameron, and Haughton. Later in the afternoon, the same two teams met again in the 4x400m Championship of America, running against others, including the formidable and ever-threatening Long Beach Poly. This time, the Edwin Allen squad of Saqukine Cameron (54.6); Monique Spencer (52.9), Marlena Eubanks (53.34) and Camira Haughton (53.85), went out full throttle with a take-no-prisoner attitude. In the end, they clocked 3:34.76, a mere 100th of a second off the record for that event (3:34.75) set by Holmwood Technical in 2001. Holmwood (3:41.17), St. Jago (3:42.79) and St. Elizabeth Technical (3:43.34) – all Jamaicans – were next runners-up, respectively. Columbia (3:45.27) and Long Beach Poly (3:45.90) were 5th and 6th respectively. 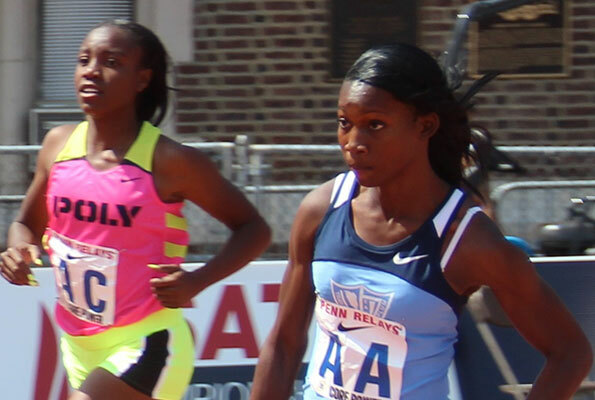 The over-38,000 Penn Relays fans in attendance on the 2nd day were able to witness first-hand a sample of the2014 Edwin Allen High School girls team demonstrate why many experts in the sport in Jamaica and the Diaspora consider them one of the best of all time. 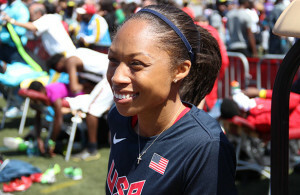 ← Previous Story Should Bailey-Cole Run The 400m?